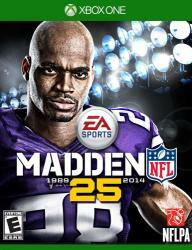 Madden NFL 25 ushers in the next generation of sports games delivering 10x more detail and unprecedented control. Players think and anticipate in the trenches and across the field. Every step is calculated to showcase the most realistic player movement ever, and the emotion of Sunday is brought to life like never before with living sidelines, rich commentary, and thunderous crowds. Madden NFL 25 changes the game forever.